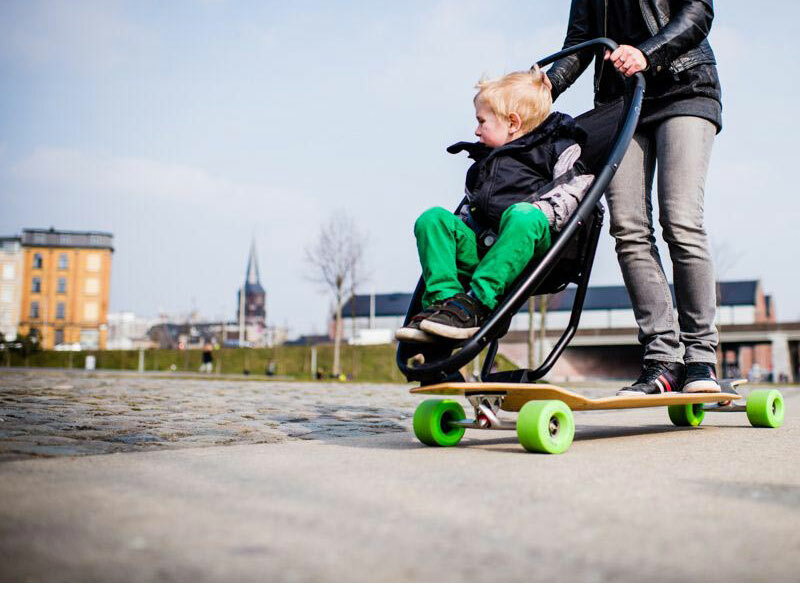 The Quinny Jett LongboardStroller is a Stroller/Skateboard Hybrid! Skateboarders rejoice! The new Quinny Jett turns an unassuming jaunt in the stroller into an invigorating skate session. 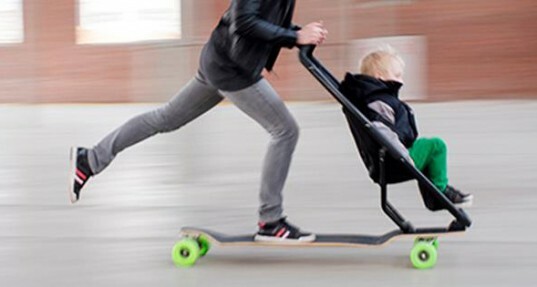 The longboard stroller was designed by Studio Peter Van Riet for Quinny, combining the sport of skating with parent/child bonding time. The Quinny Jett is also a sweet alternative for navigating urban streets, giving parents a green transportation option for getting from point A to point B with their kids in tow. Skate-savvy moms and dads don’t have to abandon their love of skating because junior is with them. 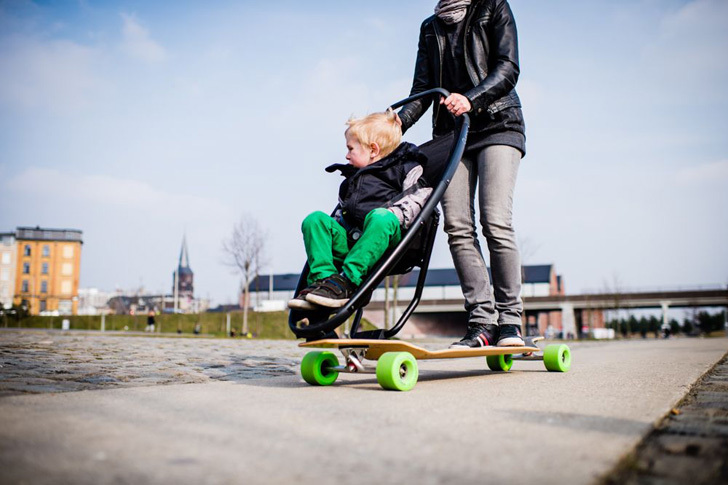 The LongboardStroller has a child seat affixed to the front of the long board, with a handle for parents to steer. The kiddie in question, wearing a helmet of course, gets a firsthand view of the excitement of skating, without the danger of being on a board himself. The LongboardStroller looks like a zipper scooter, but as a long board, it has more flexibility and mobility, boasting the ability to make more comfortable turns and maneuver around obstacles. Even though regular long boards don’t have handles (or kids hanging out on the front of them) the rider experience is much more fun than pushing around a regular stroller. Each board on the Quinny Jett LongboardStroller is handmade by a professional long board craftsman, making it authentic and street quality. This stroller proves that you don’t have to leave the city when you become a parent — instead you can navigate a metropolis in style with this really fun stroller for parents and kids. This belongs in the "What will they think of next?" category. The Quinny Company was established in the Netherlands in 1950, by Nicholas Quint. In the years that followed three of Mr. Quint�s sons joined the business, and in 1989 the Company manufactured its first strollers. In 2001 Quinny was acquired by Dorel Industries, based in Montreal, Canada. Dorel bills itself as �the world�s largest manufacturer of juvenile products in its categories,� one of which is strollers. If you are a bicycle enthusiast, Dorel also owns Cannondale, one of bicycling�s premier brand names.